This is the fifteenth of a new series of images from across North Carolina from my travels, and from the long intervals that I have spent with my camera making a record of where I have been. Upon examination of these random images, I concluded that best format would be the one page arrangement, where I cut the images to 1280 pixels wide, arrayed in a wide viewed 'fancybox' series, where there is a title of explanation, and maybe a bit more, but mainly, the photo should speak rather than my words. In fact, I plan to put my words on hold for a bit here, which will be to the fine relief of a great many. 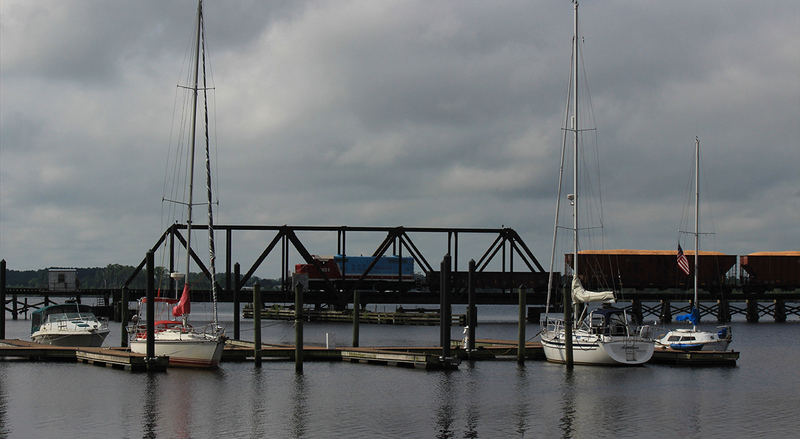 In the county of Beaufort, we have a working trestle, which is the subject of many of my local images: Above. Not only does the trestle form the fording backbone of the Norfolk Southern railway, it makes for a sturdy platform for me to take vast quantities of my photos. In this reverse image from the former photo, we see one of the many flocks of Geese flying in to Castle Island to bed down for a long winter's night: Below. photos by Stan Deatherage Click images to expand. 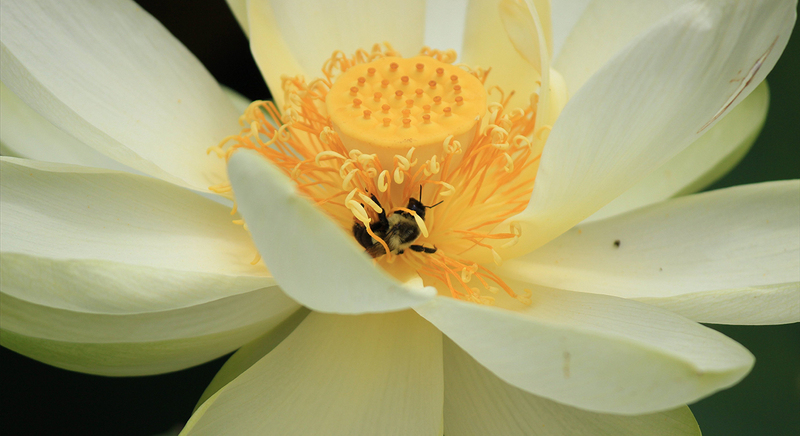 Now, while staying in Beaufort County, we see the small pollinators, here along Washington's waterfront in the large lily-pads' reproductive flowers, that make the fruit of this Earth come into existence. All fruits and vegetables could never sustain this Earth's population without these busy pollinators: Above. 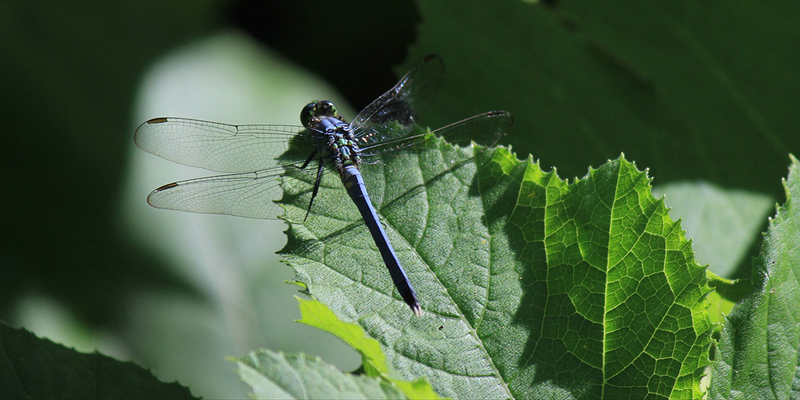 Then, in my garden at my home in Mac'swood, we see a prehistoric insect - the dragonfly: Below. photos by Stan Deatherage Click images to expand. Far down the coast of North Carolina, we follow Highway 17 to Brunswick County, just on the south side of the Cape Fear River, there is Orton Pond, where another prehistoric creature exists. North Carolina's most prehistoric of all our wild creatures - the Alligator - stealthly in his ambitions, awaits its next meal: Above. 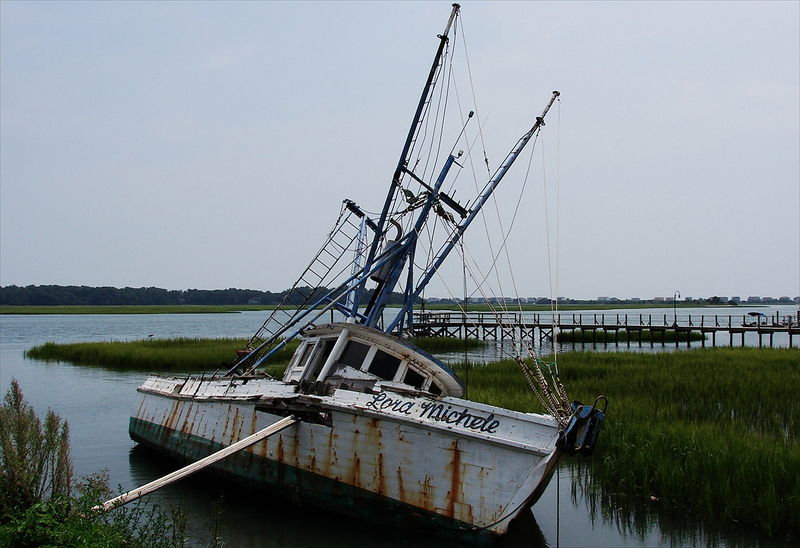 Further south, in Brunswick County, among the rustling reeds of the salt marsh near Shallotte, there are derelict ships. 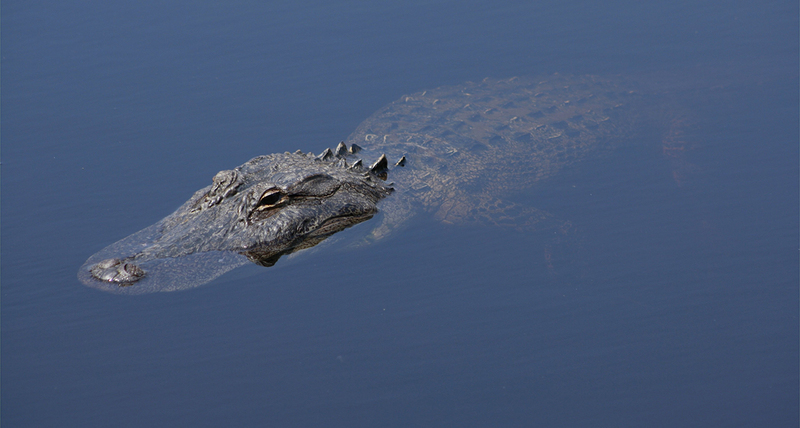 Could there be a patient Alligator in the shallows? : Below. photos by Stan Deatherage Click images to expand. We travel back the way from whence we came and jog a bit farther east to the county seat of County Carteret - Beaufort. The clearer waters here are at the base of the Outer Banks, and may be the boating capital, per capita, of central eastern North Carolina. 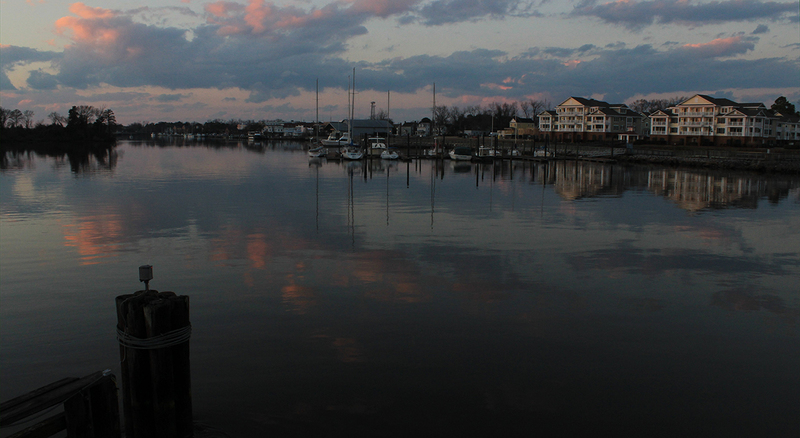 The waterway view of Beaufort's enigmatic waterfront: Above and below. photo by Stan Deatherage Click image to expand. Beaufort's historical placement in the scheme of the central Outer Banks is a natural harbor, well protected and perfectly situated to funnel ships, boats and pleasure craft to the high seas of the Atlantic Ocean. To that extent, we recognize the proclivity of pleasure craft of all stripes: Above and below. photos by Stan Deatherage Click images to expand. 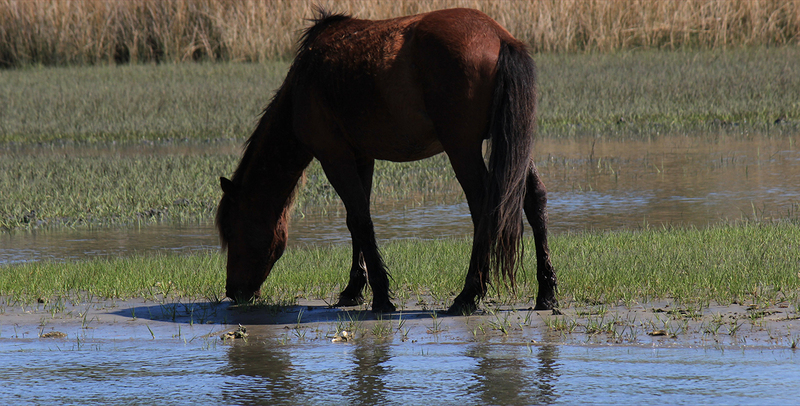 Across from Beaufort's waterfront is the western edge of Shackleford Banks and its famous wild inhabitants - the wild Spanish cargo lost at sea - the wild horses of North Carolina's Outer Banks. A wild Spanish Mustang of Shackleford Banks: Above. photo by Stan Deatherage Click image to expand. After Beaufort, we head north on Highway 17 to Craven County and its historic waterfront old and new. 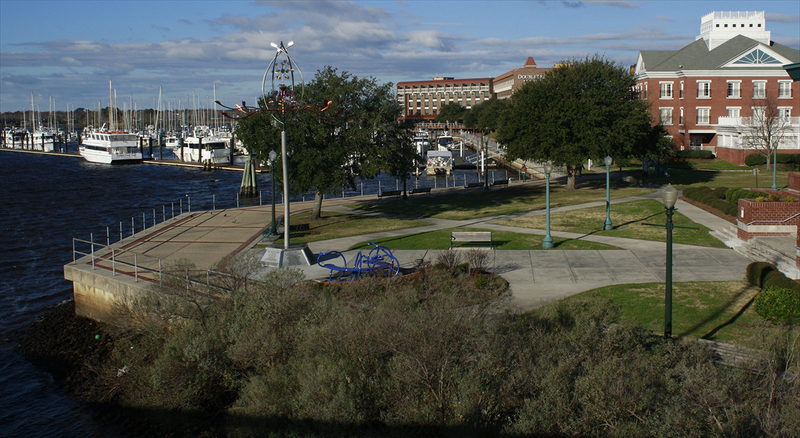 The New Bern waterfront in Craven County - the new waterfront on the Trent River: Above. 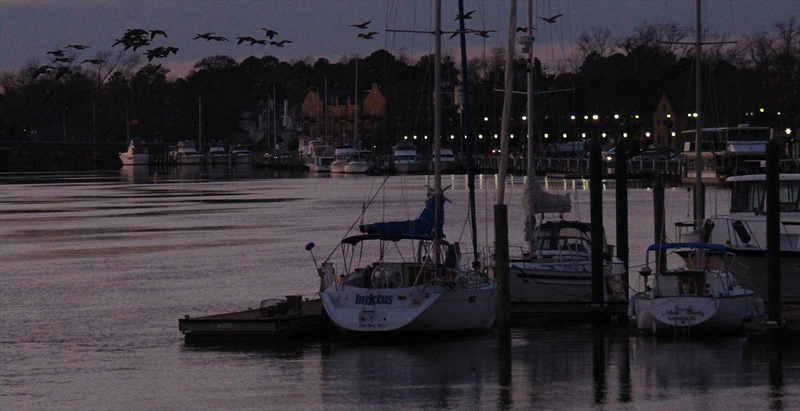 And the older waterfront of old New Bern on the Neuse River: Below. photos by Stan Deatherage Click images to expand. 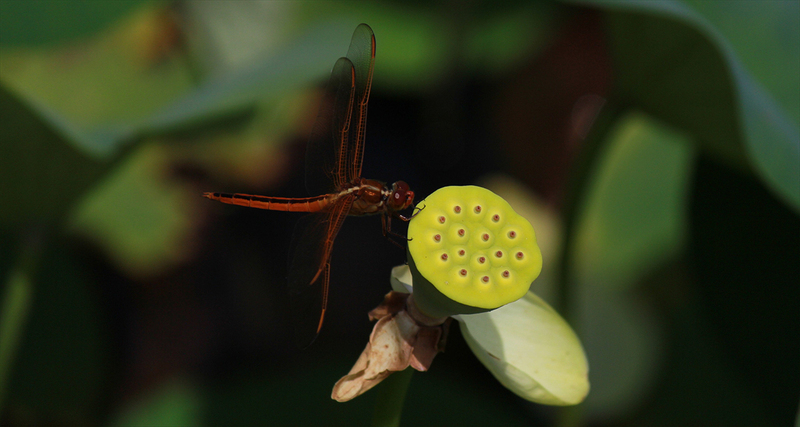 Along Washington's waterfront, a lone dragonfly, among many, rests upon a single lily pod: Above. And then from that sturdy trestle's platform, we witness the sunset on the Pamlico River in the bitter cold air of January: Below. photos by Stan Deatherage Click image to expand.